Twenty-year-old Michael Vink created cycling history with his solo victory in the RaboDirect Road Cycling National Championships in Christchurch today but from a southern perspective it was James Williamson's victory in the Elite Road Race which completed an historic double for the Wakatipu/Central Otago club and Cycling Southland following on the heels of clubmate and triathlete Nicky Samuels' victory in the Womens race on Saturday. Vink held off the chasers to win the gruelling 183km race by just six seconds to claim the overall honours and successfully defend his under-23 crown. 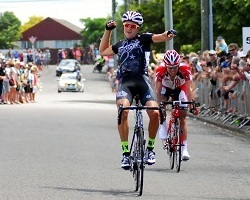 He is the first rider to take out the under-23 national title and win the overall honours. Vink also claimed the double after winning the under-23 time trial on Friday, while his winning time of 4:38:09 was a course record, more than five minutes faster than Hayden Roulston’s time in 2011. Today his solo attack on the penultimate lap worked, holding off a fierce charge from Williamson and US-based Team Bissell pro Patrick Bevin (Taupo) who came up just six seconds short. For 22 year old Williamson it has been a bitter-sweet few weeks after finding out before Christmas that PureBlack Racing team cannot fund their planned European programme after a promising maiden year in the USA in 2011. He answered in the ideal way and hopes his national title will help secure a spot in a professional team this year. “I am stoked to take the title. It was touch and go if we would get up in the last lap and I definitely wanted to be first across the line. But I knew the other under-23 boys had more to ride for and went with them. The pace was on from the start, riders recording up to 60kph as the field strung out in single file before a group of nine riders made the first break. The group, including former Olympian Robin Reid, Patrick Bevin, favourite Jesse Sergent and Vink, pushed out to a 1m38s lead at the halfway mark. They were reeled in two laps later before Waikato’s Shem Rodger went off the front, opening up a 1min 13sec buffer before he was caught with three laps remaining. With Rodger dropped, Taranaki’s Michael Torkler, Vink and Vennell pushed clear. Torkler was also dropped with Vink and Vennell opening up a one minute lead with two laps remaining. Vink turned up the heat up the hill on the penultimate lap as Vennell dropped away to link up with the chasers including Bevin, PowerNet Tour of Southland winner Josh Atkins, Williamson and defending champion Jack Bauer. However it was the young Cantabrian who got the ultimate reward for his brave attack on a day of fierce racing on a telling circuit with only 13 of the 70 starters finishing. Elite: James Williamson (PureBlack Racing, Southland) 4:38:15, 1; Jeremy Yates (Mico Protrain, East Coast North Island) at 1:49, 2; Jeremy Vennell (Team Bissell, ECNI) at 2:04, 3. Under 23: Michael Vink (Mico Protrain, Canterbury) 4:38:09, 1; (course record); Patrick Bevin (Team Bissell, Waikato Bay of Plenty) at six seconds, 2; Josh Atkins (Canterbury) at 22 secs, 3.